Ever since Wal-Mart announced their collaboration with the queen of fashion-forward comfort, Norma Kamali, we have been skeptical of everything including pricing, quality and popularity. So instead of simply heading up to Norma's West 56th Street store to see the samples and place an order, we had to make it difficult with a true store-to-internet goose chase. Our goals: the batwing cardigan and the jersey wrap dress. Our first stop for Norma: the Super Wal-Mart in Secaucus, New Jersey. We baited our hook with Wal-Mart's low, low prices and waited for a friend with a car to bite. It didn't take long and soon we were entering the land of bulk frozen tilapia and "cake batter" ice cream. Despite the abundance of Heidi Klum's favorite Jordache jeans, there was no Norma Kamali anywhere in the store and apparently they weren't due to receive any. We left with lots of apple juice, but heartbroken still. We later discovered that other acquaintances, living in very suburban areas, had also come up empty at their local Wal-Marts. 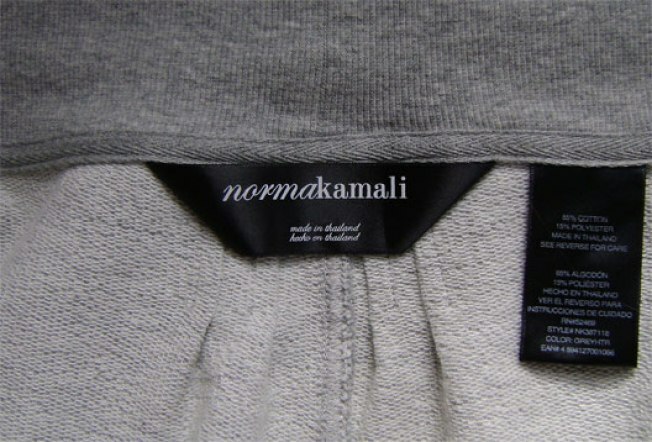 Finally we gave in to the power of the internet and its inventory; 80+ pieces of Norma Kamali online for our taking. By this point, the best items were already sold out (talking about you, batwing cardigan) and instead we snagged the aforementioned wrap dress, the cycling tank top, capri leggings and straight-leg jeans. Should you be eyeing the collection as well, note that prices fluctuate between online and in-store; purchase an $18 top and it will arrive with a $15 pricetag. That said, the pieces are surprisingly well-constructed and wearable. The $6 tank top is a steal but beware the jeans as they are decidedly "mom jeans." What can you expect from $15 denim? In any case, buy this recession-friendly clothing now as every day we see more "Out of Stock" labels. Norma is making bank on this collaboration.